Apple is working with Salesforce to create new iPhone and iPad customer-facing apps. The collaboration helps push Siri and Siri Shortcuts into customer support apps, as well as the apps that consumers use for business, travel, and more. 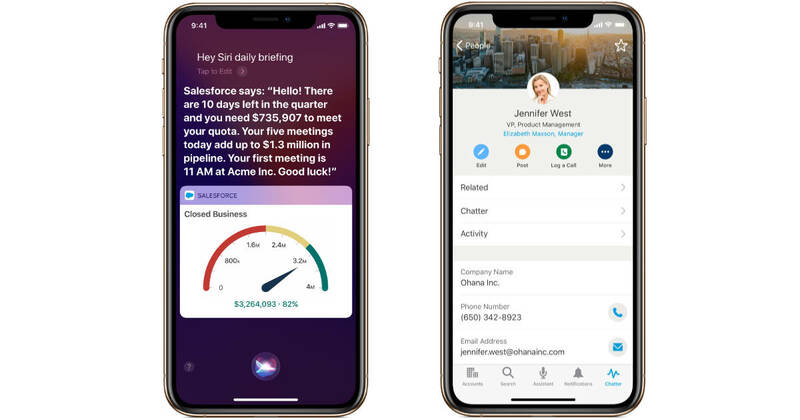 Apple and Salesforce today announced a strategic partnership that brings together the largest customer relationship management platform and iOS, the world's most advanced mobile operating system, that enables powerful new mobile apps for businesses. In collaboration with Apple, Salesforce redevelops its app to embrace the native mobile platform with exclusive new features on iOS. Normally speaking, apps developed with the Salesforce platform can now make it easier for users to add new voice commands. Thanks to Shortcuts in iOS 12, they can also automate tasks. For customer service, this makes it easier to keep track of customer comments and actions. For end-users, they can more easily benefit from the services that companies offer. Imagine, for exe, getting off a flight and saying, "Hey Siri, I have arrived." That causes calling an Uber, who checks you in at your hotel, and sends a message home to leave your family now that you are safe on the ground. There was a time when the only option for a robust CRM platform was Windows. Apple is trying to change that in iOS and collaboration with Salesforce makes that more a possibility.